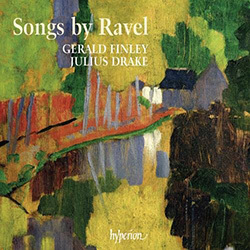 The award-winning partnership of Gerald Finley and Julius Drake continue their musical explorations with this beautiful and thought-provoking disc. Gerald Finley’s lustrous tones, extraordinary gift for characterisation, and direct, unaffected utterance make him an ideal and revelatory performer of Ravel’s songs. These works, somewhat under-appreciated in the composer’s oeuvre, demonstrate the endless variety and vast emotional scope of Ravel’s musical sphere. Charming folk-song settings contrast with the almost surrealist world of Histoires naturelles, which caused outrage at its first performance. Yet this cycle contains some of Ravel’s most dreamily beautiful music: the still, crystalline ‘music of silence’ created in Le martin-pêcheur. In the words of Roger Nichols, who provides the fascinating booklet notes, ‘From the sepulchral gloom of Un grand sommeil noir to the final exclamation ‘Je bois / À la joie’ …, Ravel’s songs embrace a whole world’. Ravel: 5 Mélodies Populaires Grecques – 3. Quel Galant M’Est Comparable? Ravel: 5 Mélodies Populaires Grecques – 5. Tout Gai! Designed by IMG Artists | Copyright 2019. All rights reserved. Terms and conditions of website use.